fat bike | Bikes, Beer, and Birds... In No Particular Order. Just Riding Along… Surly Krampus. Just in case you don’t read the Surly blog…. Photo pulled from Dirt Rag’s Facebook page. So now that I have finally secured the funds to start my new bike build, I am unfortunately at another crossroads. 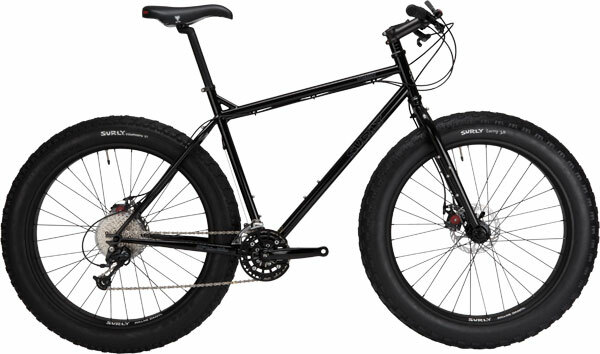 This time, I am still leaning towards the Troll, but also leaning towards a full fledged fat bike. I seem to go back and forth with this, over and over, and waiting is not helping me one bit. So, for this installment, here is the next round of my bike comparisons. This was my first taste of the big wheels. Only ridden around 100 miles, in a haste I dismantled it and sold it off, only to buy another single speed to then sell off, etc. I regretted it after the fact, but hind sight is 20/20 right? Anyway, after riding this bike, I really wanted to try out a full on fat bike. 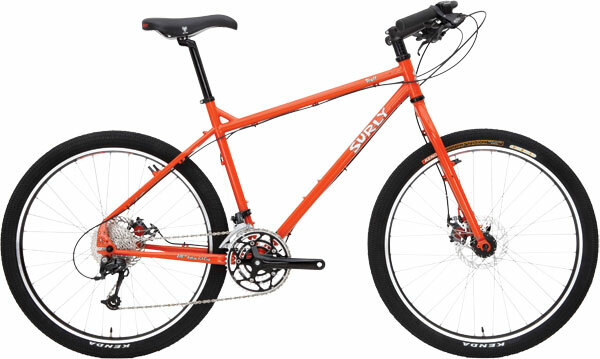 So recently, in my planning stages for the new bike, I found a used Surly Puglsey on the local Craigslist that got my mind rolling on the big wheels again. Unfortunately I was not as quick as I should have been with it, and it sold. So that leads up to the comparison. First, there is newer model coming out later this year. From what I have read on a cycling forum, it will be in the fall. The newer model adds bottle/cage mounts on the fork, and another bottle mount on the underside of the downtube. I would like those options, but I am not sure that I can wait until then. Patience is a virtue that I do not possess. This is not a deal breaker for me though. Second, the Troll fits big tires. I plan on using the 26×2.6 Maxxis Ardents on the frame, should I get it. But this could be the opening of Pandora’s Box for tires. It could only lead to wanting a little more rubber (enter “That’s what she said” joke here) and the Troll would be maxed out. Not a true fat bike. The Troll would always be lacking in the tire department. The next few days will be tough on the cycling decisions, thankfully that is the worst thing in my life that I have to worry about. For that, I am thankful. Surly Troll picture from their site, click the link to the right to have your mind blown on their products. QBP, purveyor of cycling goods, has brought the masses many great fat bike related items. 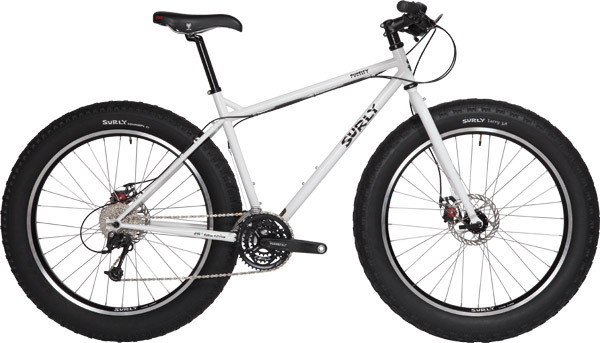 The Surly Pugsley, the fat tires, 45NRTH, the Salsa Mukluk, the Moonlander, and now this: Check it. To give you the rundown, a new Salsa dual suspension fat bike. Granted it is still a prototype, but this is a big step for the fat biking world. I would imagine if this goes to production, a bunch of hardtail fat bikes will be popping up on eBay and Craigslist. Very nice Salsa! -135mm front and rear hubs, giving you a bail out SS hub in the front in case you wreck your rear derailleur out in the wilderness. Being able to easily switch wheels, shorten the chain, and ride home is a BIG plus in my book. -Good parts spec for the price point, around $1600 complete. -Rack mounts front and back. -Easy single speed option, with track style horizontal dropouts. -The only cons for this bike are the rim width and the steel frame. Yes, I have the steel from on both the pros and the cons list. I do like steel. But steel can corrode a little easier than aluminum, so therefore it is also a con. -Nice looking bike. I love the matte black finish with red decals. -Rolling Darryl rims, on dishless wheels. The rear hub is 170mm, and the front is 135mm. Big, wide wheels. -Good parts spec, very similar to the Pugsley. -Salsa Enabler fork. I love this fork. I think it is the perfect rigid fork for a bike like this. And with Salsa’s Anything Cage that mounts directly to the fork, this bike is ready for adventure! -No SS escape plan, no swapping of the wheels if you trash your derailleur with different size hubs. I guess you could always just shorten the chain, but no horizontal dropouts. -Grip shifters. I hate grip shifters. Sure, easy to switch, but just not my preference. -Price. The Mukluk 2 is priced higher than the Pugsley at just around $2000. Ouch. Also, just read on an online forum that the Mukluk 2 has already sold out. So that leaves the very pricey Ti Mukluk, or the lower spec’d Mukluk 3. Too bad. If I had the cash though, I would buy a Ti Mukluk in a heartbeat! Gorgeous bike. All pictures of the Puglsey, BO Pugs, and Mukluk are from Surly and Salsa’s sites respectfully. Now normally while on vacation, I try to stay out of bicycle shops unless I need that random part to fix one of my bikes, but while driving by this little shop, a certain bicycle caught my eye. Sitting out front of the shop was a Sun Spider AT (Click for specs. ), a beach cruiser fat bike! I had never seen one of these before, but I had to take a closer look. This bike was made for cruising around slowly in the sand, with 26×4.0 tires, a relaxed geometry, a Sturmey Archer 2 speed coaster brake hub, and did I mention 26×4.0 tires? This bike really made my day, and for the price of around $800, it almost went home with me. The main reason that it did not was due to the fact it is a cruiser bike only, no rim or disc brake mounts on this rig. Still a very cool bike.